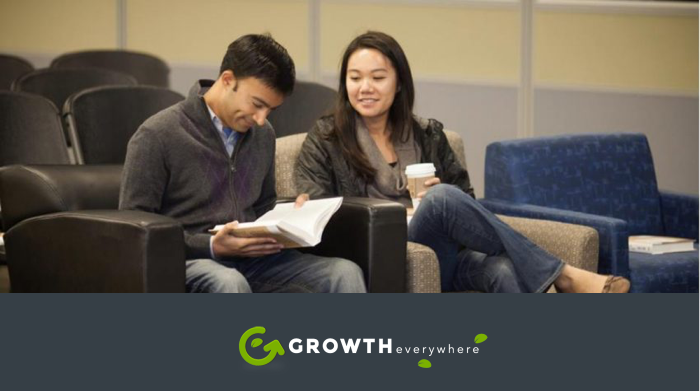 Ada and I recently sat down with Eric Siu for a discussion on the Growth Everywhere podcast, a podcast focused on sharing the stories of entrepreneurs to help the next generation of entrepreneurs thrive. We talked about where the idea for Notejoy, our most recent startup, came from and how we set out to solve the problems that we experienced first hand as leaders at LinkedIn and SurveyMonkey. We talked about some of the initial challenges we've had along the way as well as some of the new customer segments we discovered have been great for Notejoy. We go on to cover some of the growth channels that have been successful for us. We then dived into the more personal side of Notejoy, talking about what it's like to build Notejoy as a husband & wife team and how we manage to keep each other productive and sane, leveraging personal & professional OKRs as well as daily standups! If any of this sounds interesting to you, do check out the podcast. Product management is fundamentally a leadership role in that you are ultimately responsible for leading a product development team to deliver a compelling product that resonates with your customers. The vast majority of what I've personally learned about leadership comes from Jeff Weiner, who I watched lead LinkedIn as CEO over the 4 years I spent there. He singlehandedly transformed leadership in my mind from an amorphous set of soft skills to a specific set of tactics that you could execute to successfully lead an organization. One of the most important lessons I took away from Jeff was the need to define your company's core, all the way from your vision to your values. It’s not enough to have an ambitious vision because unless that vision translates into how you manage your company on a day-to-day basis, that vision will never be realized. I saw Jeff operationalize this advice on a daily basis, whether it was repeating the mission, vision, and operating priorities every bi-weekly all hands, speaking to specific values in weekly leadership meeting discussions, and more. 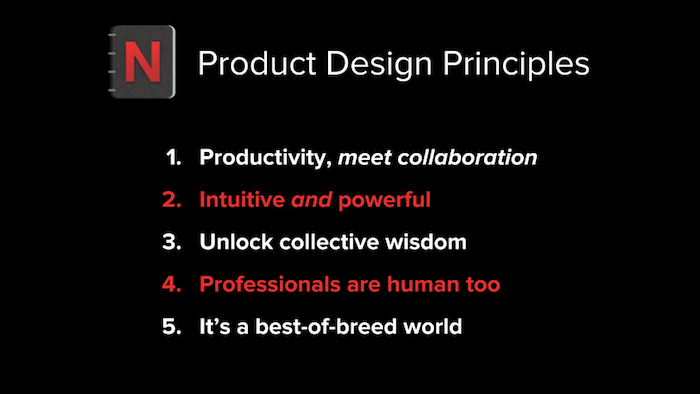 I've found one of the best ways for product teams to make this advice actionable is by articulating your products design principles. Great product managers start by defining an ambitious vision of how the world will be a better place if they succeed. They then go on to develop a strategy by which their product will ultimately dominate the market. But then the team's real work begins: designing the actual product, validating your assumptions, executing to deliver the product, and rinsing and repeating to continue to validate and iterate on the offering. Too often the design/execution phases lose sight of the vision and strategy that was so painstakingly put together in the first place and they thus often lose their value. By translating your vision and strategy into a set of specific product design principles and then leveraging them throughout the design/execution phases, you can avoid this fate. In August I got invited back to LinkedIn to give a talk. But what was surprising is they were interested in me giving a very different type of talk than I've normally done. Instead of sharing best practices on product management or entrepreneurship, they were most interested in me sharing my career journey, the risks I took and trade-offs I made along the way, and the lessons I've learned in managing a career in today's day and age. Not to disappoint them, I took up the challenge. I shared how I've used the framework of optimizing for passion/skill/opportunity fit throughout my career and the many trade-offs in my own journey where I picked passion over everything else, often against other people's sage advice, and how that ultimately enabled me to find my dream job. As product managers we engage in product debates every day with our design and engineering partners, fellow product managers, cross-functional partners, managers, executive stakeholders, and more. The best product debates help refine our solution, make us better as product managers, and are intellectually stimulating. Yet so often they don't feel anything like that. It turns out expressing a dissenting opinion and constructively coalescing on a better solution requires the skillful practice of the art of discourse by all participants. 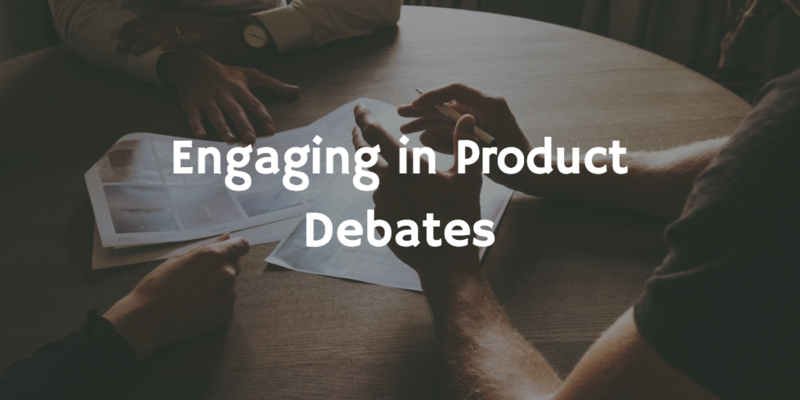 So I wanted to share some of the best practices I've learned to make product debates constructive and valuable. 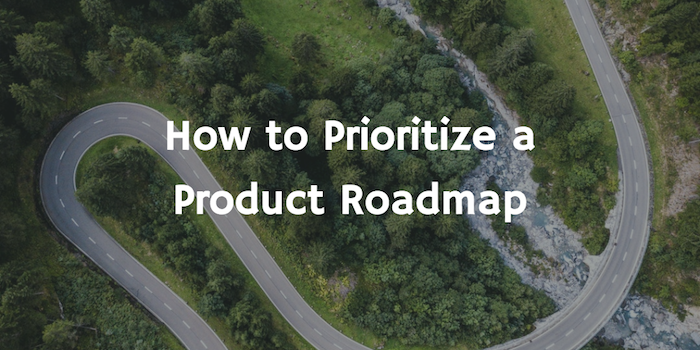 Probably the most frequent question I get from product managers is around how to successfully prioritize a product roadmap. I think when folks come to me with this question they are often looking for a formula they can apply or at least an algorithm they can go through to prioritize their roadmap. But the reality is crafting a successful product roadmap is far more art than science. I instead wanted to share the three lenses we apply each time we put together a quarterly product roadmap at Notejoy. Each of these lenses looks at prioritizing a roadmap from an entirely different perspective. The art then comes in determining how to ultimately put together a roadmap balancing these often diverging priorities. Let's look at each of these lenses in turn.